Students enrolled in the Commercial Driver License-A Program at the Center for Career and Community Education recently had a chance to explore a career in transportation with a local company. 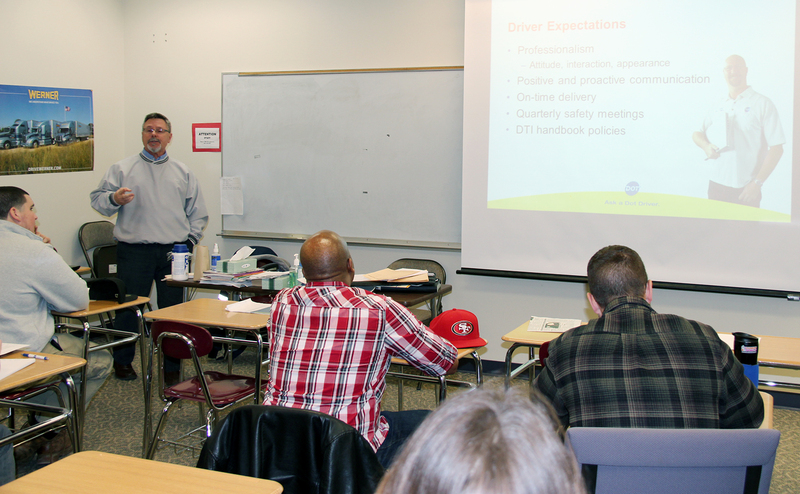 Students in the CDL-A program at the Center for Career and Community Education listen as Steve Kuchko, assistant transportation manager for Dot, discusses some of the company’s expectations of its drivers. 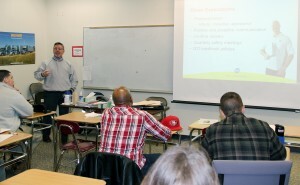 Dot Transportation employees Hal Williams and Steve Kuchko discussed the many opportunities available to graduates of Ken Koegel’s CDL-A course. The starting pay, benefits and incentives were a few of the factors that piqued the students’ interest. In addition to the potential of working for a growing company, students were also interested in average pay and driver expectations. According to Kuchko, drivers are expected to be timely, fuel efficient and safe on the road. Those qualities, he said, also are tied in to pay increases. Kuchko said that while each driver’s annual pay depends on a variety of factors, the company’s lowest-paying driver made $57,150 last year. The average pay grows with years of service, and drivers can expect to make around $75,000 with Dot Transportation after two years, he noted. “This is a great career and there are a lot of opportunities for you after you get your license and complete this program,” Kuchko said. The Center for Career and Community Education is a new adult education partnership between the Center for Instruction, Technology & Innovation and Cayuga Community College that offers extensive programs to a variety of learners. The offerings are designed to provide adults with noncredit programming in career and professional development, adult literacy, corporate training and leisure learning. For more information regarding the CDL-A program, visit CiTiboces.org or call 593-9400.